In a high school book the author said these paths have all the same distance. Is that true? how to convince myself (and my students as well) they all have the same length? By a sequence of reflections of setions of each path ... each path can be shown to the same length as the red path. Turn the picture by about $55^\circ$ clockwise, so that the paths are made of horizontal and vertical segments. Then you will see that any of those paths is as long as it takes to move from $A$ to the 'right', all the way to the place 'right above $B$' and then move 'down' all the way to $B$ (darker black line added on the picture). 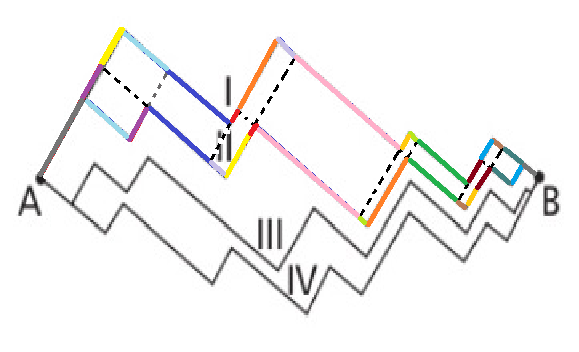 Note that same colored segments have the same length. Translating vectors doesn't change their magnitude. 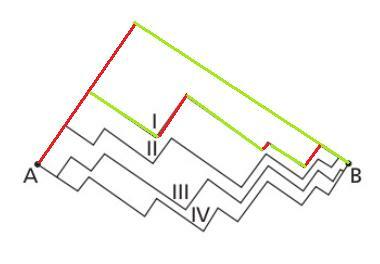 The small red (green) vectors sum to the big red(green) vector. All the angles appear to be right angles, and paths go in only two directions: let's call them N (up-and-right in the diagram) and E (down-and-right). Now imagine, for each path, moving all the E segments down the bottom, and all the N segments over to the right. 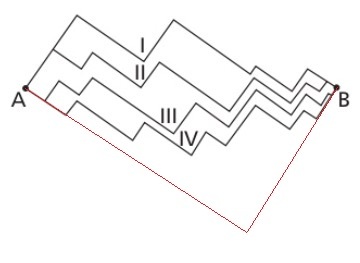 You'll get the same path from A to B for all 4, and rearranging segments doesn't change the length. Edit: Donald Splutterwit has posted a picture of exactly what I was describing. I hope you defined that every path had endpoints A and B. You may like to play 'architect' with your students. Define a 'step' in terms of rise and run. (where both are > 0 which you may elect not to do in the beginning). Then have them design their flight of stairs where individual steps may have variable rises and/or runs with the object of connecting the first and second floors of a building with parallel floors. Hopefully you or someone may illustrate a 1 or 2 step solution. Label bottom and top A & B. Generalize by comparing the sum of Rises,,, Sum of Runs. Is there any object/metric within all points are at same distance to each other? Can more than one hamiltonian graph have the same set of hamiltonian paths? Two congruent segments does have the same length? How to explain to a school kid that on a sphere the shortest path between 2 points is given by a great circle? Why do these two surfaces have the same extrinsic topology?